7Here is the article I wrote for my dining column in the Korea Herald’s “Expat Living” section back in October. I’m going to catch up with those articles yet. This version includes pictures. Chuseok came and went over a month ago, and I’m sure that gift pack of Spam is still sitting in your kitchen. You may even have a few cans left over from last year. It’s perfect for a pot of budae jjigae, especially if you have some real bacon on hand and some good quality sausages. Fry it up with eggs, and it’s a stellar breakfast. There have to be other applications for canned ham. Before you scoff at that last sentence, I thought canned ham was just one step away from dog food until a couple of years ago. The canned ham industry began in America in the late 1920s and gained popularity during the Great Depression and World War II. As America’s economy hit its post-war boom, the affection for cheap canned meat declined. History tells us that the best recipes come from the creativity of scarce resources, and America didn’t have that problem after the war. Asia picked up canned ham and loved it, as we see especially in Korea. Hawaiians have found ways to make canned ham taste pretty darned good. One of the most popular items is musubi, which is similar to Japanese nigiri sushi. It makes a great snack and a decent packed lunch. I was happy just making a dinner out of it. Here’s the way I make it, which combines traditional Hawaiian techniques with a few variations. Take some warm cooked rice and sprinkle it with salt and rice vinegar. In classic sushi, the rice has sweetened vinegar. In Hawaii, it’s usually salted rice. Use a rice paddle to mix it by first slicing the rice and folding it over. Taste it and adjust so that it is subtle and tangy. Open the can of spiced ham and dump out the contents, keeping the can for use later. The smaller size works best. Slice the ham thickly, around one centimeter widths. Fry them in a dry pan over medium high heat, being careful not to scorch them. Prepare a teriyaki sauce by mixing one part soy sauce with one part mirim and a little sugar. You can add this to the ham in the pan and let it reduce down to a syrupy consistency, or you can put it aside as a dipping sauce. Take the ham off the heat. Pack the rice into the Spam can, about two to three centimeters deep. This is why the shorter cans work best. The trick is to really pack it tightly with your fingers. If too much rice sticks to your fingers, fill a bowl with water and dip your fingers in it. Turn the can over and tap the rice out. Get some dried kimbap-style seaweed (gim) and cut it to match the width of the rice. You can use the can as a guide. 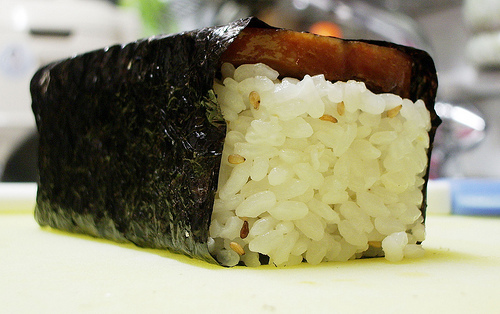 Place a slice of spiced ham on top of the packed rice and carefully wrap the seaweed around it. You can rub some water or rice to seal the edges of the seaweed. Eun Jeong's is farthest away. My mutilated first attempt is closer. You can play with more variations by adding cheese, kimchi or a thin omelet. The taste is not completely what you expect. In fact, it’s a bit luxurious. The crackle of the seaweed complements the crispy edge of the smoky fried Spam while the rice balances its intensity, and the vinegar gives a tangy zing. It’s a way of introducing a little sunny Hawaii to your diet as the season turns colder. Fatman likes to eat it with a smear of ssamjang and maybe a slender slice of pineapple or kiwi . . . mmmm. Interesting, I’d like to invite you to take some time to drop by at Foodista. We have launched an online food and cooking encyclopedia ala wikipedia where you can contribute and share what you know about food and cooking techniques.